1) What is a Box Bridge Locker? A Box Bridge Locker is a group of standard box lockers assembled in the form of a rectangular arch. The top of the arch features a coat rod for hanging full length garments. 2) What are the advantages of a Box Bridge Locker? The primary advantages of a Box Bridge Locker are that it optimizes space usage in a confined area and it offers a coat rod for hanging full length garments. 3) Can the Box Bridge Locker be ordered as an assembled unit? 1) What is a Commercial Lockers with an optional Locking Coin feature? It is a standard locker with a lock that is opened and closed with a key, coins or tokens. 2) Are Commercial Lockers with an optional Locking Coin feature used in retail locations? Yes, they are used to provide convenience to the shopper (fewer things to carry around) and limit shoplifting by limiting the number of bags or places a shoplifter can put things. 3) Can you make a profit from Commercial Lockers with an optional Locking Coin feature? Absolutely. These lockers are rented for short periods of time and the fees are the property of the locker or building owner. 1) What type of metal do you use for your Metal School Lockers? We use a standard 16 gauge steel that is durable and will last decades. 2) Will your Metal School Lockers rust? Metal will rust but our Metal School Lockers utilize a powder-coated method of paint application that is very durable and adheres extremely well. However, if the locker is scratched or chipped it should be repaired with paint and that will prevent any long term rusting problems. There are a number of locking options you can select from. Locks can be installed in the locker doors at the factory. Or, the locker door can have a handle which accepts a padlock from the user. 1) What is a Fire Extinguisher Locker ? It is a two tier locker with the upper tier used as a storage space for a fire extinguisher. It has a lower tier that is used for waste disposal. 2) What is perhaps the most important factor in determining the location of a fire extinguisher? Visibility. People have to be able to see a fire extinguisher to use it. 3) What are the other important factors in determining the location of a fire extinguisher? Accessibility, maintaining the accessibility over time, location away from potential fire sources and having enough fire extinguishers for the size of the building are other very important location factors for fire extinguishers. Box metal storage lockers optimize your storage space needs with their ability to accommodate the greatest amount of locking storage area within one unit. Many different places can take advantage of this, including theme parks, bus stations, and airports because they come with the option of being used with a digital or keyed lock that the person using the locker takes with them while their belongings are kept safe and secure until they return. There are various metal box lockers to choose from so you can customize the look of the storage area to ensure they fit comfortably with the interior design. 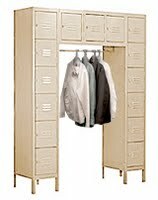 Standard box style lockers are constructed with 16 gauge steel and come in five or six tier units. You will give your customers, employees, or visitors a secure place to store their belongings while they travel, play games, exercise, or work. One wide and three wide units are individually sold. This allows you to customize the storage area to accommodate the space you have for storage and passageways. 12 inch, 15 inch, and 18 inch depths present a way to further enhance the control you have on how much storage space each individual metal box locker has to provide. Vented Box Style Wire Mesh Heavy Duty Box style vented lockers are made with 16 gauge steel to ensure a long-lasting product that will keep customers or visitors happy with the storage options you present to them. While you’re given the airflow that is highly desired for some items that will be stored, you will still have a secure locker that will hold items that aren’t visible to others. Box style metal vented lockers come in various depths so you can choose which size works best with the place they will be kept regarding the amount of room available. One single unit or three units, with six tiers, can be bought to give you a better way to fit in the amount of lockers you need. 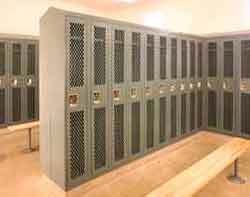 Box style metal bridge lockers are made with durable 16 gauge steel to stand up to high traffic locker rooms and areas prone to vandalism, such as theme parks. 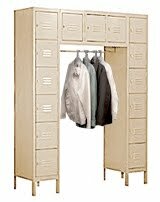 Box style metal bridge lockers are ideal for areas that have a limited amount of space but need enough room to keep clothes hanging to avoid unsightly wrinkles. Guests that don’t want to keep clothing within their individual locker can easily hang it on the convenient coat rod. There are two colors to choose from that come with six tiers that equals 16 boxes that are 18 inches deep. For superior security, consider using box metal lockers with digital or keyed locks. Your guests or customers that are using the box will feel relaxed leaving their personal possessions in a locker that can only be opened with the key that they carry with them. The more comfortable a person is to leave their items in your theme park, bus station, airport, or other type of building, the more likely they are to come back and use your services again. XPB Lockers carries a wide variety of bleachers, commercial mailboxes, commercial bathroom equipment and commercial signage delivered nationwide. If you can not find what you are looking for call us toll free at 1-877-483-9270 and we will find it for you. Our home office is located in New Braunfels, Texas with warehouses located throughout the United States that enable us to service all 50 states including Washington DC, Fresno, California, Sacramento, CA, Corpus Christi, TX, Plano, Texas, Garland, TX, Laredo, Texas, Lubbock, TX, Houston, Texas, Nashville-Davidson, Tennessee, Las Vegas, Nevada. Portland, Oregon, Oklahoma City, Oklahoma, Tucson, Arizona, Long Beach, California, Atlanta, Georgia.